We cater for the global market with highly efficient 118 A - Perma Aluminium Polynet Butyl. We are hailing as the chief Manufacturer, Exporter, and Supplier of Perma Aluminium Polynet Butyl from Mumbai, India. This chemical is endowed with excellent waterproofing property, which makes it stand out among the lot. It is deemed ideal for the construction industry. To avail it minimal prices, contact us! Perma Aluminium Polynet Butyl Tape is used for covering all cracks, Construction joints, bends, Corners and joints of non homogenous materials. Perma Alumunium Polynet Butyl Tape is used for joint sealing of the metallic and non metallic roofing such as aluminium, zinc asbestos sheeting and the roofs of buses. 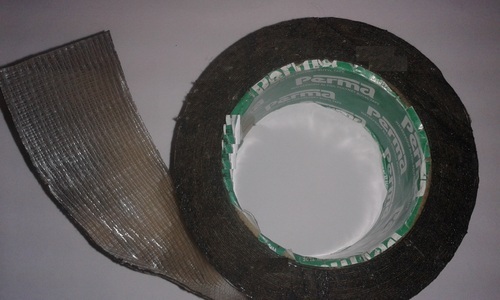 Perma Alumunium Polynet Butyl tape can be used for sealing all joints in timber framed houses. It is used for sealing all the corner joints and the joints between the horizontal and vertical RCC surfaces of the sunken slabs of toilets and bathrooms after water proofing. It is also used for covering of all cut outs and pipe joints in the walls. Perma Alumunium Polynet Butyl tape can be used to cover the ends of corrugated sheets in roofing & Sealing the joints around turbovents. Perma Alumunium Polynet Butyl tape is resistant to hot and cold temperature. It withstands 90o C Without yielding. Perma Alumunium Polynet Butyl tape is totally weather-proof. It insulates and makes the taped area waterproof and airtight. Packing : Perma Alumunium Polynet Butyl tape are supplied in cartons. ASF-50, 16 rolls and ASF-100, 8 rolls per carton.